THE TOWERS – A Novel of 9/11/2001. On the morning of September 11, 2001, Commander Dan Lenson, USN, is visiting the Pentagon. On that same morning, his wife, former Undersecretary of Defense Blair Titus, is at a job interview at the World Trade Center. In the action-packed scenes that follow, both Dan and Blair have to fight to survive the attacks. Meanwhile, NCIS agent Aisha Ar-Rahim is investigating a terror cell in Yemen, and former SEAL Teddy Oberg is pitching an action movie to investors in LA. Teddy, Aisha, and Dan immediately become involved in the military reaction to the attack. Dan is assigned to the staff of the Joint Special Ops team in Afghanistan. His mission: to overthrow the Taliban government. Aisha undertakes a dangerous undercover mission in Yemen to uncover links to Osama bin Laden and ultimately his location in the Shah-i-Khot Valley, Afghanistan. Teddy, having rejoined the SEALS, is assigned to Task Force Cutlass, a mission that takes him to the border of Pakistan to hunt down and kill bin Laden. Meanwhile, Blair struggles with recovery from serious injuries, and has to decide which course her life will take from here. The 13th Dan Lenson novel, The Towers is a fascinating, accurate depiction of the events of September 11 and the military response, informed by interviews and deep sources in the Navy, the SEALS, the Marines, the NCIS, and the author's own military experience. A past master of fast-paced sequences and heart-pumping drama, David Poyer takes the reader into the center of the action and face-to-face with the enemy. 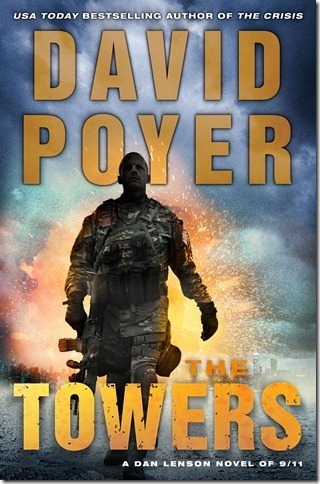 Buy The Towers on amazon. Captain David Poyer is the most popular living author of American sea fiction. His military career included service in the Atlantic, Mediterranean, Arctic, Caribbean, the Middle East, and Pacific. 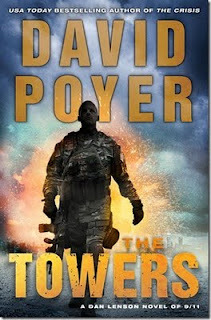 The Towers is the thirteenth in his continuing novel-cycle of the modern Navy and Marine Corps, following The Med, The Gulf, The Circle, The Passage, Tomahawk, China Sea, Black Storm, The Command, The Threat, Korea Strait, The Weapon and The Crisis (all available in St. Martin's Press paperback and ebook formats). He lives with novelist Lenore Hart and their daughter on Virginia’s Eastern Shore. Visit him at at http://www.poyer.com/ or on Facebook. Great to have the perspective of one with that experience. I'm going to also check out your prior interview with David - this book is intriguing.